Growing up, I frequently felt like an over-sensitive, hyper-passionate freak -- I was bullied from kindergarden to 10th grade. I continually failed to find acceptance, or ways to constructively BE my intense, wild self. People alienated me, but animals spoke my language. I was tortured by another housing development replacing forests, and angered by limiting gender roles and stereotypes. I immersed myself in reading/writing, making art, music and dancing. At the top of my tree, or barefoot in the woods, I felt connected and loved. Then, I'd have to return to the giant, hostile high school. When my younger brother got into drugs, I lost his companionship. Having to react to his troubled behavior, but not knowing the source for years, our parents had little to spare for their less volatile child. Through tides of hormones, shame and rejection, I fended for myself. I listened to my intuition and relied on being in the woods, in the water, or on the jungle gym to buoy my spirits. Mostly friendless, and haunted by vivid dreams and insomnia, I was frequently given the choice of self-harm, or to explore and integrate my gifts. Though my Art and English teachers validated my talent, it was the raw force of creativity that drove me forward. Often times, my gifts felt dangerous or subversive, but they showed a path out. In retrospect, this was Grace, or Shakti. Eventually, the wounded child grew up, along with her peers. This, and attending a small college far away, gave me a fresh start. To my surprise, people behaved differently -- they liked my wit, open-mindedness and passion for life. No longer having to defend myself and developing friendships calmed my fear of rejection, while my intuitive voice, or Grace, became a stronger ally. Some years later, I married my college sweet-heart. When ready, we tried to have a family. This began a long battle with my unexplained infertility. Month after month, my hopes, and false pregnancy symptoms were dashed. With each new dip and rise of expectations, my tension and frustration grew. My discomfort with allopathic fertility treatments made me quit after only months, and fueled a deeper commitment to Yoga, which awoke the desire to teach it. Meanwhile, I pursued holistic treatments in Classical Chinese Medicine, Ayurveda, Homeopathy, Applied Kinesthesiology and more. At first, the quest was for healthy ways to solve my problem, but after a while, I questioned everything: my femininity, relationships, my family history, Earth's overpopulation, and on. My attitude changed from, "why can't I get what I want?," to, "who's will is more important, mine or God's?," to, "can I want what I already have?" After 8 years of trying, I let myself off the hook. Then, we entered the adoption process. After grueling choices about what kind of program to pursue, came the big list of tasks and fees to establish our file for birth mothers to view. Then, came the waiting. Energy that had been freed from no longer asking my body for miracles, got diffused by waiting on an organization, the whim of strangers, and luck. At 39, my tolerance ended, along with my desire to parent. It wasn't meant to be. Leaving the program was liberating, but taxing for my marriage. That took plenty of Grace to get through! 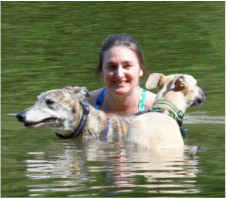 But, in the end, it was freeing -- just in time to adopt a greyhound, move, and begin my Shamanic studies. Whew! Lessons of the past and present offer daily guidance, and maintain my perpetual student status. My ego is alive and well -- but, not given serious duties. I enjoy kids, but am a content non-parent and a vivacious aunt. I've come to know and celebrate my creative and nurturing qualities as manifestations of the Divine Feminine. I enjoy my own company as much as sharing myself with the world. For leisure-time (non-writing), I care for our greyhound rescues, hang out at our local Co-Op, explore my crawl stroke and pump iron, learn Spanish, and search for excuses to wear costumes, sing or dance.